African gray parrots like this one have long been known to possess amazing language skills, but the latest one surpasses them all. 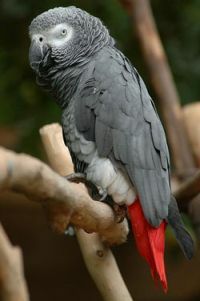 N’kisi, a captive African grey parrot, is believed to be one of the most advanced users of human language in the animal world.1 He possesses a vocabulary of 950 words, shows signs of a sense of humour, and uses words in their proper context. He even invents new words and phrases when confronted with novel situations. [If a chimp did this] the scientific community and popular media would be in an evolutionary frenzy. This defies evolutionary predictions. Chimpanzees, not parrots, should be making the biggest leaps in linguistic logic since they are supposedly more closely related to us than birds. In fact, chimpanzees have been receiving countless hours of intense sign language training from devoted human trainers. Although chimps such as Washoe and Kanzi are adept at utilizing sign language, they have not progressed to any high degree of complexity as is characteristic of humans who communicate by signing. These chimps just don’t have the internal ‘software’ in their brains to master complex language skills. Elephants may be next in line for speech training. Last year, an elephant living in a South Korean zoo was recorded speaking eight Korean words.4 The elephant ‘spoke’ by placing his trunk in his mouth and shaking it while exhaling. It is unclear whether or not the elephant was merely practicing the art of imitation or actually understood simple language. You can bet that elephants will now begin to receive thousands of hours of intense language training, just as chimpanzees have been privy to for years. In addition, elephants rival chimpanzees in their ability to use simple tools and exceed chimpanzees in demonstrating a human-like emotional capacity. See Jumbo Minds. What if chimpanzees possessed a vocabulary of 950 words, used words in context, and formulated simple sentences like N’kisi the parrot? What if chimpanzees manufactured a variety of innovative designs for their insect probing sticks like New Caledonian crows? What if chimpanzees ‘buried’ their dead and showed keen interest in the bones of their long dead counterparts like elephants? The scientific community and popular media would be in an evolutionary frenzy. A more objective look reveals that chimpanzees don’t stand out from all other animals in their linguistic, intellectual, or emotional capacities. Several other groups of animals demonstrate higher intelligence, show more human-like emotions, and better assist mankind in a variety of crucial tasks. The Bible makes it clear that birds, elephants, and chimpanzees were all created as distinct animal kinds. However, human beings were specially created in the image of God with an intellectual, technological, emotional, and spiritual capacity far superior to any animal. Kirby, A., Parrot’s oratory stuns scientists, BBC News, 26 January 2004, <http://news.bbc.co.uk/1/hi/sci/tech/3430481.stm>, accessed 24 January 2007. Return to text. Pickrell, J., Crows better at tool building than chimps, study says, National Geographic News, <http://news.nationalgeographic.com/news/2003/04/0423_030423_crowtools.html>, 23 April 2003. Return to text. See also Catchpoole, D., Petulant parrot proves a point—but atheists can’t (or won’t) see it, 26 September 2006. Return to text. Talking elephant surprises scientists, CBS13.com, <http://cbs13.com/topstories/local_story_251103255.html>, 8 September 2006. Return to text.